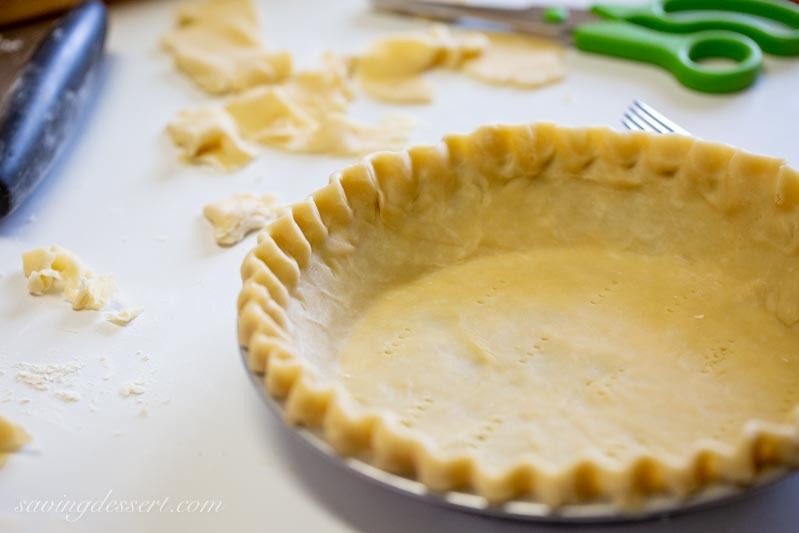 Try our simple directions for making Perfect Pie Crust in 3-easy steps! 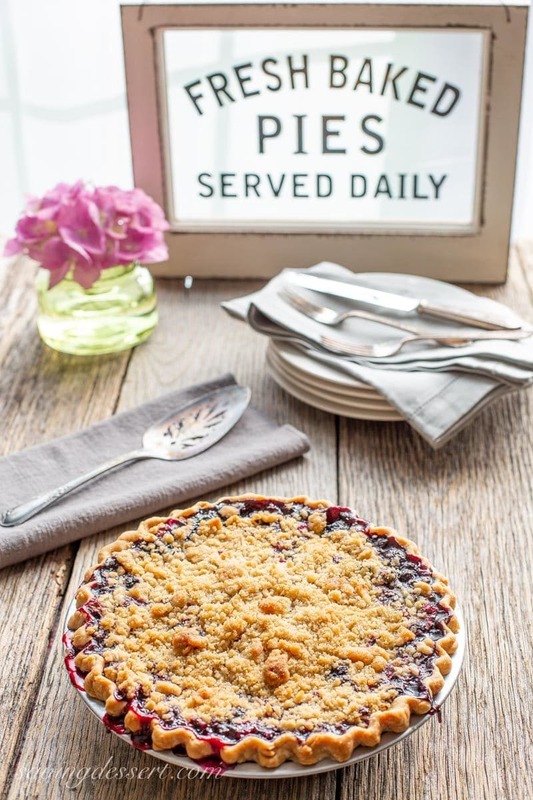 Blueberry Crumble Pie – made with fresh, sweet blueberries topped with a crispy crumble all baked up in a wonderful summer pie. 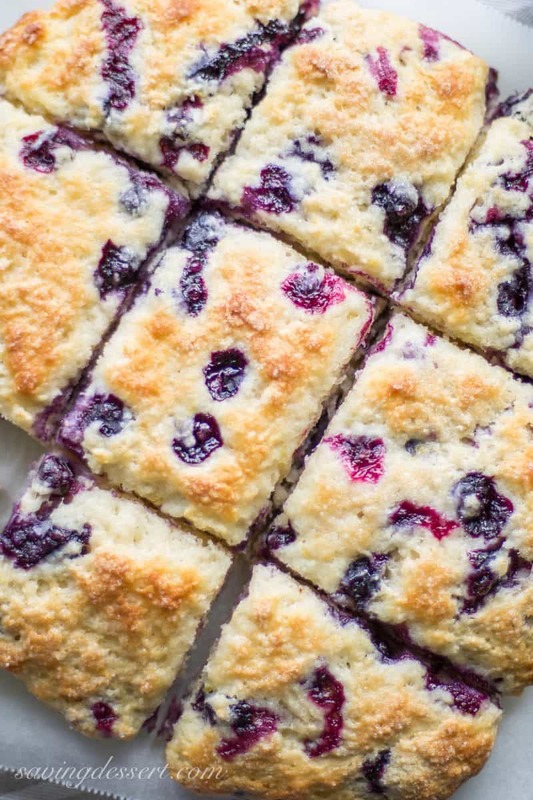 A must make for your ripe blueberries! My new favorite Saturday morning adventure starts at Miller Farms Market where you pick your owns fruits and soon there’ll be sweet summer corn too. You may remember I recently picked more than 20 pounds of strawberries and made numerous recipes, froze a bunch and even shared with my son and daughter-in-law. When Miller Farms said the blueberries and raspberries were ready, I had to go back. Blackberries should be ripe in a few more weeks and I plan to take helpers with me next time! 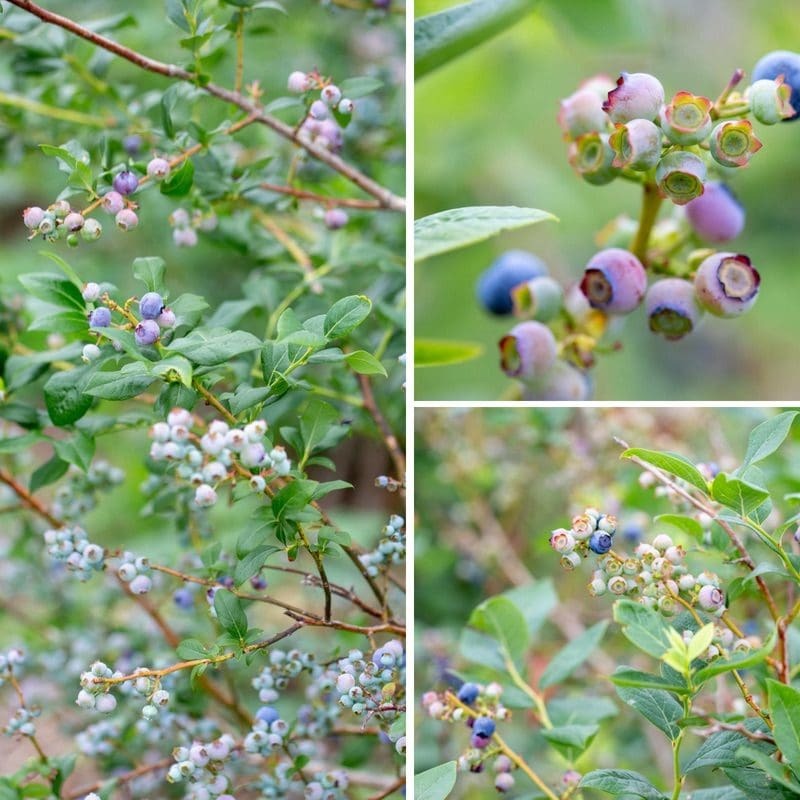 The blueberry bushes are not as old as the strawberry, raspberry and blackberry plants so the berries are not as abundant – and were not quite ready in large amounts. I was able to work a while and get enough though. I think I missed my calling and could have been a pretty good field hand/picker of fruits and vegetables. I just love being outside. Stay tuned for black and red raspberry desserts coming soon! I like to make my own pastry using our Perfect Pie Crust Recipe but this pie could easily come together in no time with a pre-made crust. My grandmother actually froze homemade crusts and entire unbaked pies but she had a giant deep freezer which ended up being an architectural dig when she passed away. Nobody went hungry at Mammaw’s house. Blueberry desserts are a personal favorite and this pie does not disappoint. In 2011 I made a pie a week for an entire year. My son was a volunteer firefighter at the time and he and his crew quickly figured out that Sunday was “pie day.” If they came late enough, I would have all the pictures I needed for the blog posts and the remaining pie was up for grabs. I enjoyed feeding those hungry young men, even though my neighbors must have thought we had a lot of fires at our house as there was often a fire truck sitting outside. I now have more than 75 pie recipes on the blog. Over the years I’ve gotten a little better with my camera so please excuse the out-of-focus, poorly composed, badly lit photos – the pies were still good to eat! There are a few steps to make this pie but it is super easy and comes together perfectly, I couldn’t be more pleased with the end result. My son, daughter-in-law and a former firefighter friend stopped by Sunday and it made me very happy to share this pie with them. They talked about the old days when I made pies on a regular basis – and it warmed my heart! Make a memory and bake a pie for someone you love! 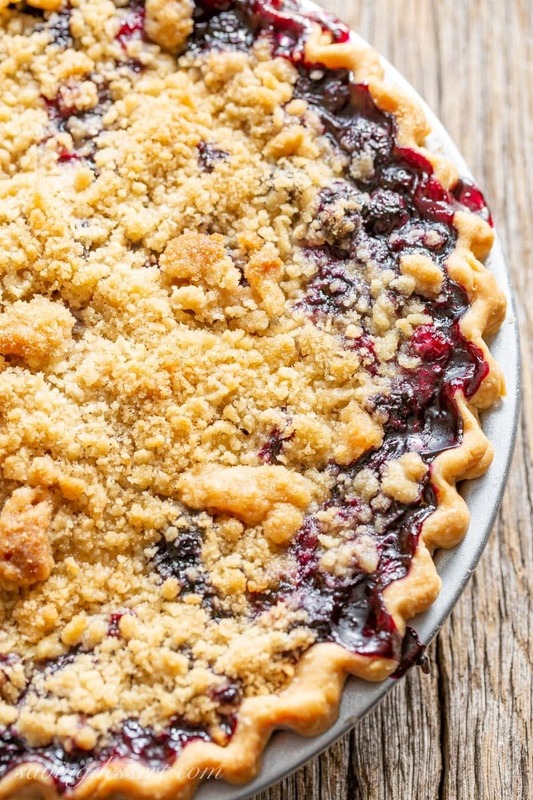 Sweet blueberries topped with a crispy crumble all baked up in a wonderful summer pie. A must make for your ripe blueberries! Preheat the oven to 375 degrees. Line a baking sheet with foil and place in the oven to preheat as well. Remove the unbaked, prepared 9-inch deep dish pie crust from the refrigerator. Line the pie crust / pie plate with parchment paper and add pie weights or dried beans. Bake the crust for about 20 minutes. Remove the parchment paper and pie weights or beans and set aside. Return the crust to the oven and bake another 10 minutes or until it starts to brown lightly. Remove from the oven and set aside to cool while preparing the filling. Whisk together the sugar, cornstarch and lemon zest. Place the clean, dry blueberries in a large mixing bowl. Add the grated apple, lemon juice and sugar/cornstarch mixture. Gently toss the blueberries to combine or use a rubber spatula and gently turn to coat. Set aside until the berries start to release their juices - 20-30 minutes, while preparing the topping. In the bowl of the food processor, combine the flour, brown sugar, butter and granulated sugar. Pulse until combined. Remove to a small mixing bowl and using the back of a large spoon, press some of the topping together to form large chunks. Refrigerate until ready to use. To assemble the pie, pour the blueberry mixture into the blind baked pie crust. Top with the crumble mixture spreading evenly. Bake on the foil lined baking sheet at 375 degrees for 1 hour. After 30 minutes, cover the pie with foil if starts to brown too quickly. Once the filling bubbles and the pie is golden brown, remove from the oven and allow to cool to room temperature. * The apple helps thicken the filling so it stays together when sliced. * Use our favorite Perfect Pie Crust Recipe in 3-easy steps or your favorite recipe. You can also use a pre-made frozen crust. 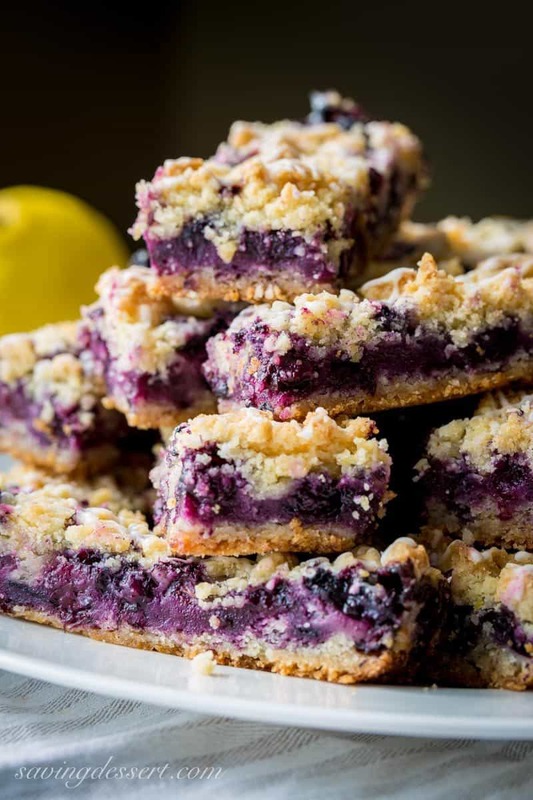 Easy Blueberry Crumb Bars ~ there’s nothing like sweet summer blueberries baked in a simple crust to excite the taste buds! This simple, easy dessert is saturated with intense blueberry flavor and hints of bright, fresh lemon. Delightfully tender Blueberry Buttermilk Biscuits served with a warm homemade Blueberry Sauce. Blueberry desserts are some of the best ever! If you’re looking for a little more inspiration, check out this Low Carb No-Bake Blueberry Cheesecake Pie ~ from All Day I Dream About Food! I really want to make these little Blueberry Lemon Hand Pies ~ from Sugary Sweets, and this super popular Blueberry Zucchini Snack Cake ~ from The View from Great Island. And don’t forget to try this Frozen Blueberry Coconut Yogurt Pie ~ from She Wears Many Hats – it looks dreamy! Hope you have a wonderful week. It’s been crazy hot and humid here in Virginia. Hope the weather is better in your hometown. Thanks so much for stopping by! 1) I didn’t use a food processor to make the crumble and instead just used my hands and it worked. 2) I used pie dough for the top as well as the crumble. The only thing I would do differently is use less sugar in the blueberry mix. I guess my blueberries were already sweet. That’s fantastic Lama! Thank you for trying it and for letting us know how it worked out for you. Great job – woohoo! Hello! If you don’t have a deep dish pie pan can you make this in a normal pie pan? Hi Chelsea – yes you can! If you have too much pie filling, just put it in a small oven-proof container and bake it along with the pie. You can have a mini-pie to taste test before the event. Hope you enjoy! Thanks for the feedback Mary but I cannot imagine why the crust was labor intensive. I’ve also been baking for more than 40 years and find this crust super simple. The time it takes to prepare the crust is less than 20 minutes for me. Most crust recipes need time to sit in the refrigerator before rolling. I love that this can be made well ahead of time. Sorry it didn’t meet your expectations. I also don’t think that grating a half an apple is a lot of work. It takes about 2 minutes to grate the apple and zesting lemons is also super easy. It adds a lot to the flavor, in my opinion. The berries sit while you prepare the topping, so it’s not really adding time to the preparation. Again I’m sorry you found that this pie did not meet your expectations but appreciate that you took the time to try it and provide feedback. Our readers will appreciate you documenting your experience. Looks amazing! Can’t wait to make this pie. I think the instructions for the blind baked pie crust are a little confusing. It sounds like we should blind bake the crust on a baking sheet and not in a pie dish. Maybe it’s just me. Thanks for the feedback Jess – I updated the recipe to clarify. I don’t understand your method of baking the pie crust with parchment paper or pie weights. Can’t I just back the crust without all this hoopla ? Hi Lise – yes you can bake it anyway you want. The reason for blind-baking a crust is to help it stay more crisp when adding fruit fillings. It will still be delicious if you don’t do this step. If you par-bake, pre-bake or blind-bake the crust, it must have something inside or the crust will slump down into the pan as it bakes. It’s really not a big deal and the beans or weights can be used again and again. Hope this helps and good luck. With the apple, did you go for a tart or sweet variety? Hi Darla – I always use a tart apple in baking. Plus for this I like one that is not too soft. Granny Smith is always a good choice. Thanks and hope you love it as much as we do. Made this pie last night, nobody in the family particularly likes blueberries, but your pictures looked so delicious it enticed to me try. Glad I did, it was really delicious (served with the requisite vanilla ice cream)! I’ll bbe looking through your other desert recipes and giving them a go as well. Hi Allie! Thanks so much for the fun comment. This is what baking is all about! I hope you loved the pie as much as we do. You really can’t beat a good blueberry pie and I bet your brother was thrilled you made it for him. Thanks for trying our recipe! Please let me know if you ever have any questions or if I can help in anyway. Woohoo! If I’m using premade crust, should I still blind bake the crust? Hi Hilary – yes you should go ahead and blind bake any crust to help keep it from getting soggy. Enjoy! Hi Jessica. The recipe is below the photos and it is printable. Sorry you’re having trouble finding it. Haha Liz – I’ve been making pies since I was 10 years old but I still learn something new every time I make one. We are students of our craft! I hope you’ll try this pie. It’s not overly sweet so it may not hurt to bump up the sugar to 3/4 cup from 2/3 cup. The crumble top is sweet and of course ice cream adds an amazing taste and texture to the pie. Enjoy! This must be freezer friendly? I’m not sure Cheree – I haven’t tried freezing this pie. I would think it would be okay to freeze the entire pie before baking. If you bake then freeze I think the crumble top may be soggy. Please let me know if you give it a try and I’ll share with our readers. Thanks for stopping by – great question! Is it still necessary to pre bake the crust if you use a different crust recipe or a boughten crust? My fruit pie recipes all go into an unbaked crust and bake crust and filling together. Just don’t want to mess this up! Yours looks perfect! Hi Trish – There’re different schools of thought on the pre-baked crust issue. I do not pre-bake crusts for double crust pies, like apple, peach, etc. It always turns out fine. When I can pre-bake I always do, to help keep the crust crispy and less soggy. That being said, I really don’t have problems with soggy crust. If you want my opinion, I say pre-bake the crust at least a little bit if you can. Hope this helps and is not too vague 🙂 Thank you so much for reading and commenting and I know you will love this pie! It’s a keeper. Hi Theresa – I just found your comment in my spam folder – thanks so much for the invite and thanks for following along on our culinary adventure. Have a lovely weekend! Made this today and it was super delicious… Def not as pretty. I felt like the crust wasn’t large enough so next time I would make more of that. But everything else was great! I haven’t cut into it yet but will tomorrow. Just wondering if you have frozen the whole pie before baking and then baked it from the freezer. I like to stock pile pies when the berries are in season. This pie looks absolutely yummy! I have not tried freezing this pie Brigitte. But my grandmother often made pies and froze them unbaked with great success. I think using frozen berries would be just fine if you don’t want to freeze the entire pre-made pie. Thank you so much for commenting – I hope you love it as much as we do! 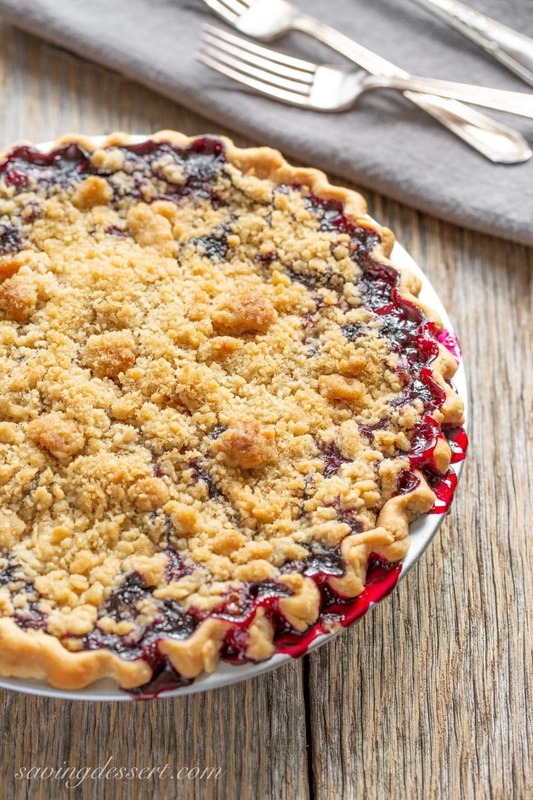 This looks “berry delicious!” I would love to surprise my family with this beautiful pie for Christmas, would it be OK to use frozen blue berries? Yes Tina – I think it would be fine to use frozen blueberries. I would thaw and drain them as much as possible. Best wishes and Merry Christmas! Thanks very much for stopping by. We share the same fun and passion for picking summer fruits. This season I picked about 12lbs of summer blueberries- Strawberries a few weeks earlier. Your blueberry pie looks amazing. No doubt tastes amazing. Thanks for sharing! Oh we do share a passion! Nice to hear from you Velva – hope you’re enjoying your summer and your fresh picked fruits! I’m going back in the morning to pick more black raspberries and to see if those blackberries are ripe 🙂 Have a wonderful 4th! Tricia, what an incredible pie! 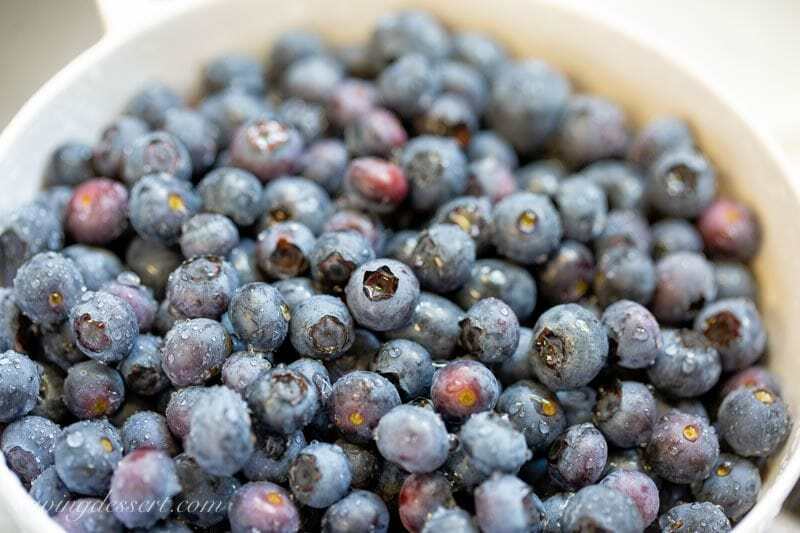 I absolutely love blueberries – I make quite a pig of myself when they in the house – I would thoroughly enjoy a large piece of your gorgeous pie. Thanks Mandy – I can’t make blueberry recipes fast enough 🙂 Have a wonderful week! Thanks Betty – I have heard that Michigan is great for berries – sounds like a great picking trip! Have a wonderful weekend! You’ve got the right idea Susan – a la mode is always a good idea 🙂 Hope you have a lovely weekend! Hey John – I love them too – nothing better – except maybe a nice cool drink of something spectacular 🙂 Can’t wait to see what you come up with next! Yum !! I made this a fews ago and made a second one for friends! We love all your pies Tricia !! We also learned how to make them from you. Thanks again and have a great weekend !! Making pies for people is one of my favorite things to do! Thanks – hope you are all doing great and enjoying your summer. Tricia, this is a great pie for sharing! I love blueberries and pie only makes them perfect. Great pics for a great pie. Thanks for the recipe, it’s a keeper! Thank you so much Pam – hope your’re having some great weather in the mid-west. Have a wonderful weekend! A stunning pie that looks too pretty to eat! I also enjoy ‘pick your own’ fruit. It just seems to taste better for some reason. You are so right Cali – something about doing all of it yourself – maybe that’s why we love our vegetable garden. Can’t wait for our tomatoes! Tricia, my husband would be in heaven if you baked him a pie a week. Your blueberry pie looks delicious . Crumble-topped pies are so good. Thanks Gerlinde – crumbles work for us too – we had to share a lot of pie but our taste testers were eager to do their job! Thanks for stopping by! Oh! I absolutely adore cobblers! And this soooo reminds me of a cobbler in pie form. Delicious! Great photos and food styling, too! Thanks Kennedy! Have a wonderful week. It seems I’m always salivating when I see your photos and read your recipes. This looks delightful, Tricia! If we lived near each other I’d be out there picking, too. I always wanted to be a farmer! I guess one can always dream. I hear you and understand Abbe – there is something to be said for plain old hard work. Thank you so much for the kind comments! Tricia this looks perfect! My mouth is watering. 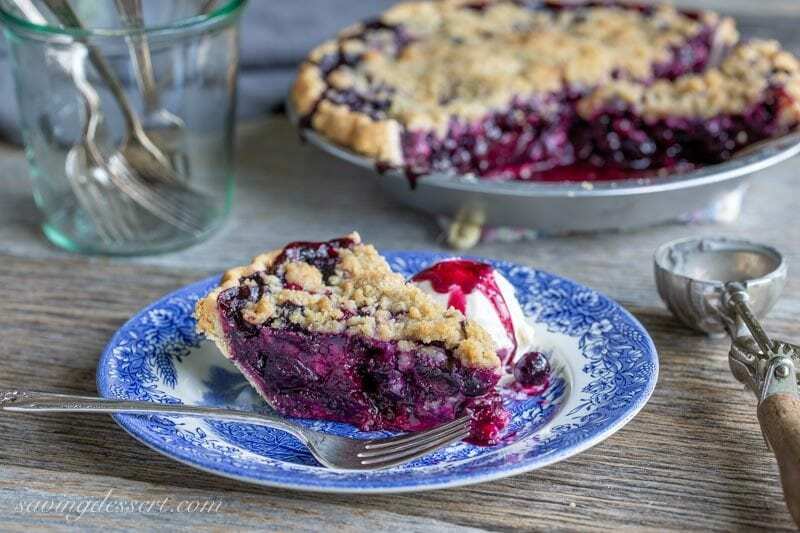 I love pie and blueberry is one of my favorites – and you just elevated it even more with that glorious crumble topping! 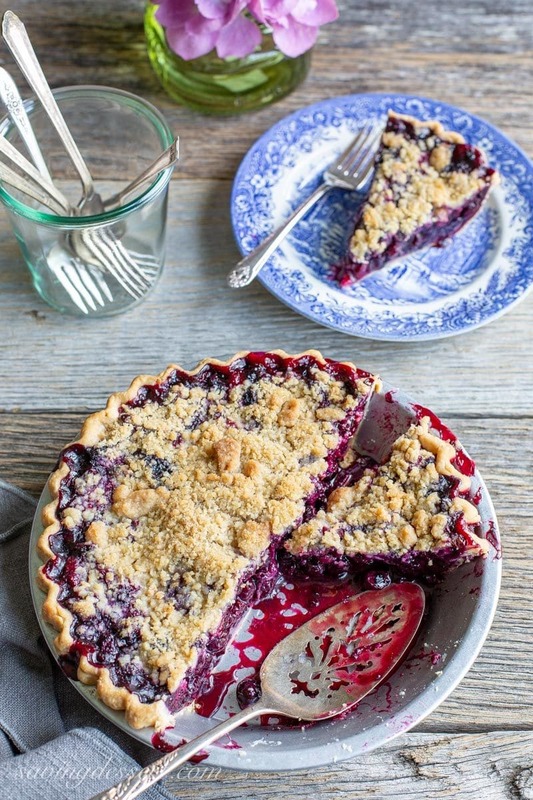 LOVE the way the berries are packed in there… LOVE the colour of the pie… how is that colour even real?… and I LOVE the crumble topping. Sometimes you can have too much pastry (really Dom?) and so a little crumble is a good thing!… plenty of cream right? Thanks Dom! The color is real – so rich and delicious! This pie looks incredible. Being a pie maker myself, Im looking forward to following your blog. I have a question. Have you ever considered using leaf lard in your pie crusts instead of vegetable shortening? The FDA is considering banning trans fats because of concerns over health risks of hydrogenated oils and organically sourced leaf lard is a fantastic substitute. Up until recently, I, too, used vegetable shortening, but leaf lard took my pie making to a whole new level. I use half european butter and half leaf lard in my crust. Your pie crust will taste amazing and will be flakier than ever. I’ve mail ordered leaf lard in the past from Fannie and Flo, but Ive recently found two butchers at my local farmer’s market that will supply it as well. Organically sourced leaf lard is essential since toxins are stored in fat cells. Anyway, just a thought…again Im looking forward to following your blog, happy baking! Hi Denise – thanks for commenting. I have considered it and have researched leaf lard in the past. I would love to try it someday – I just haven’t had a big need since I don’t seem to make as many pies these days. Thanks for the info. Tricia this pie is so beautiful. The ample filling, the color; it just feels like a relaxed summer day. I envy your Berry picking. Our rain has pushed everything out here and blueberries don’t grow in Colorado. Will live vicariously through your haul! Hi Tricia, love anything dessert and fruit filled this time of year, this is beautiful. How lucky for those firefighters and how special to be remembered that way. Take care! Thanks Cheri – I agree that fruit rules! Thanks so much Becky! Sorry about the heat – we are supposed to hit 100 today. Not ready for this! 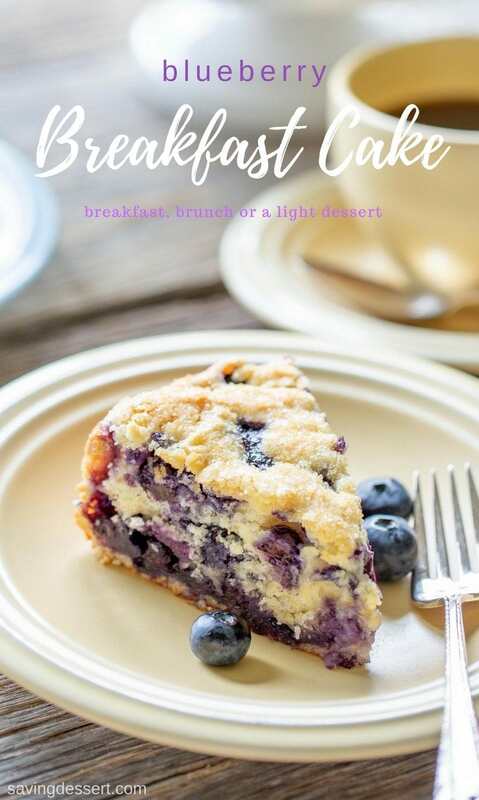 I just LOVE blueberries and crumb topping put this in the OVER the top category and that means it’s a must make for me! Thanks Diane! I love them too and really like the crumble top. Have a wonderful week! You should be titled The Queen of Pie Makers, Tricia. This is a gorgeous pie, I can never get them to look as pretty as yours. I’m curious to know what the grated apple does. Is that what makes the pie set up so nice? I know cornstarch is a thickener and you have that too. I have my own blueberry bushes and they’re now 3 years old and are loaded with berries. I think a pie is the perfect way to celebrate! Although I think the birds must be making blueberry pies too as they are definitely helping themselves quite bountifully to my prized berries. You are too kind Chris. Your recipes always look amazing and so well composed. I read someone a long time ago, that adding a little grated apple to a pie like this will help the filling set up better. This pie will run all over the place if cut when it’s hot, but cooling to room temperature makes all the difference. I think the apple helped because it stayed together without being stiff. I only used 1/2 of a small apple but it seemed just enough. The leftover pie refrigerated well (according to my son) and I’ll let you know about freezing. My traveling husband is traveling so I hid a few pieces for him in the freezer. Thanks! This would have run if it was cut while hot – even though it would have been delicious to eat that way. The pie can set at room temperature for about 8 hours. Yummy! Tricia, I didn’t “know” you back in your amazing pie-making year but I have seen and drooled over many of those pies. Clearly, you are *the* pie expert. This could not look more enticing! I can picture you out in the summer just gardening, picking fresh fruit like this on a nearby farm, and then heading home to make an incredible meal that would include a pie like this. What a lucky household! : ) Hope you had a great Father’s Day weekend. I’m not an expert Monica but I did win a blue ribbon at a County fair one time for an apple pie. I was thrilled and shocked! I love to make pies and have always enjoyed playing with dough 🙂 Have a great week! Great story about the firetruck parked outside your house! A pie a week is a great habit to get into for practice making pastry. And this recipe looks amazing – hope I get a chance to try it this summer too! Thanks Beth – I love a good challenge 🙂 Hope you get to try it this summer -it’s a keeper! Crumble tops are so tasty June. Have a wonderful week! wow This is one of the BEST blueberry pies I have ever seen. I must bake this…maybe for my husband’s birthday. Thank you so much Angie – that means a lot coming from you – your recipes and desserts are always gorgeous. Hope your husband loves it! Thanks! Could you tell me if I can safely use extra crumb topping that I have kept in my fridge for about four weeks? Wow Debra – thats a good question. I think it would depend on the life of your butter. If it was old to begin with, I guess not – if it was fresh when you made the crumble topping it would probably be fine. If it’s not much I would throw it out – but I hate having an upset stomach! Hope you have a lovely weekend. What a beautiful pie! And blueberry pie is one of my favourites 🙂 Pinned! Thanks Jennifer – I am a berry nut! Love, love, love them all 🙂 Have a wonderful week!